any of the usual suspects doing the NEC this year. Yes, me , Craig and Michael are, driving down early Friday and staying Friday night in Coventry, then home Saturday afternoon. 996 Carrera2 2001 Arctic Silver - GT3 Aerokit. 986 Boxter 1999 Zenith Blue. 986 Boxster S 2000 Arctic Silver (SOLD). 944 2.7LUX Guards Red (SOLD). Hi Alan,did you see the speedster on a Boxster?i think it was a stark one from America. According to the DVLA web site it is a Black Porsche Tax till April 2019 Mot Oct 2019 Would love to find out more details who commissioned and built this ? Can't remember company name but conversion cost was £55k plus your donor car. Being done in America by Starke. I’ve found a Starke one,it looks nothing like it!the windscreen on the stark looks massive,in fact I can only find computer images of a finished car. That silver thing is a Boxster with a body kit basically. It looks much better in the pictures than it did in real life. It was way to big and the proportions were all wrong making it look odd and ungainly. That's only my opinion for what its worth. 89 944 S2 new floor. sills. and loads of other sheet metal,968cs arbs, rebuilt brakes.all new poly bushes and mounts,968 castor mounts,968 cs steering wheel,cup 1 17 inch 7.5 and 9 inch wheels,and loads of other bits new as well. 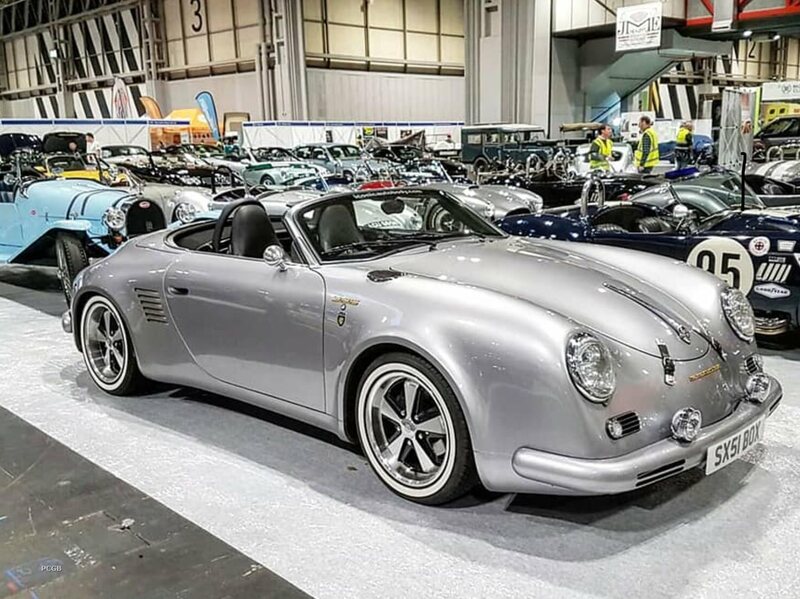 Don't hold back Colin ..that silver thing Correct would need to see it in the flesh to make ones mind up ..just looks good in the photo but at £55K for the kit would rather just buy a Speedster from the likes of Vintage /Chesil /Speedster Clinic for £10K cheaper and buy a 987 as well..
It’s like one of those big 4x4 fiat 500 things. They just don’t look right. It did look big,ive got a 987 and I love it,I’m 6ft plus and 52 and I can get in and out no problem.i had a z3 for a couple of years and only bought my 987 in February because the z3 was feeling cramped.i love the speedsters but I couldn’t get in one.